Love video? Hooked on Instagram Stories and Insta Lives? Well you’re probably going to love the latest news from Instagram this week, with the launch of its long-form video service, IGTV, to celebrate hitting a milestone 1 billion users. Video has proved to be a big hit for the company, rolling out a range of services to extend the offering and satisfy the demand of all of us eager to catch up on the latest from our favourite people and brands. According to a Gartner L2 report, just last year, video engagement on Instagram (16%) far surpassed both Facebook (1.5%) and YouTube (0.3%) during the same time period. The average number of views received by a brand were reported as: 5.2 million views on an Instagram video, 14.8 million views on a YouTube video, and 18.8 million views on a Facebook video. So what does it mean for brands? When it comes to sponsored posts, according to a study by Mediakix, video content on the platform, attracts up to three times as many comments as a sponsored photo. When thinking about your Instagram video, it’s worth considering that according to Digiday, 85% of Facebook video is watched without sound. And data from Wistia, shows that drop off in engagement occurs quickly as length increases. If you can hook the audience within the first 30 seconds, they are likely to stick around and engage. IGTV lets users create content exceeding the current maximum 60-second clip limit for the first time. 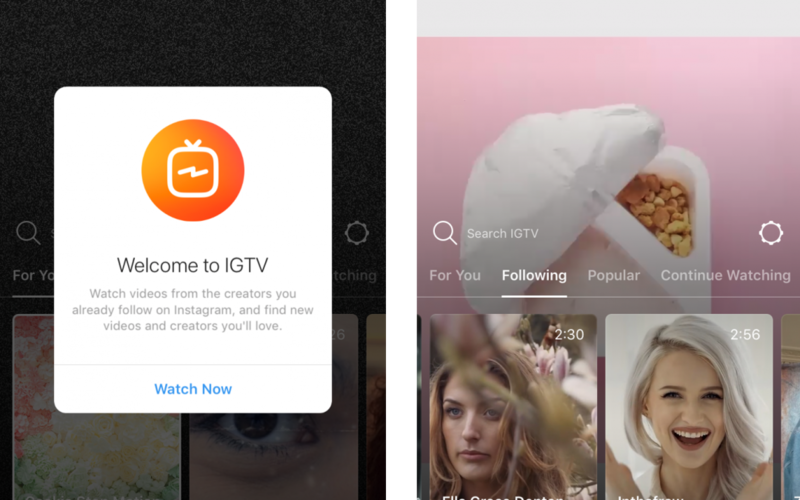 IGTV will show videos in portrait mode, which Instagram says is the “natural way” people use their phones. He said: “All the data we have shows that people are spending less and less time in front of TVs, but spending more and more time on their phones”. Is this the end of the dual screen? Why watch television, and join in the conversation when you can get involved on one device?